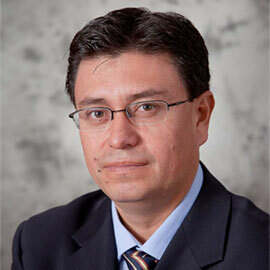 M. Fabricio Perez is an Associate Professor of Finance at the School of Business and Economics. He joined Laurier in 2008. He received his PhD from Arizona State University in May 2008. Refer to Perez's CV for an inclusive outline of his academic background. His research interests include econometric theory and financial econometrics with focus in asset pricing models and corporate finance. His research has been published in the Journal of Financial and Quantitative Analysis, Journal of Banking and Finance, Journal of Empirical Finance, Journal of Financial Econometrics, Geneva Papers on Risk and Insurance, Journal of Comparative Economics and Review of Development Economics. Estimation of Multivariate Asset Models with Jumps, with L. Ballota, A. Loregian and G. Fusai, Forthcoming Journal of Financial and Quantitative Analysis. Factor Models for Binary Financial Data, with Andriy Shkilko and Konstantin Sokolov, 2015, Journal of Banking and Finance, 61, S177-S188. Dynamic effects of idiosyncratic volatility and liquidity of yield spreads in corporate bond markets, with Madhu Kalimipalli and Subhankar Nayak. Journal of Banking and Finance 37(8) 2013: 2969-2990. Two-Pass Cross-Sectional Regression of Factor Pricing Models: Minimum Distance Approach, with Seung C. Ahn, and Christopher Gadarowski, Journal of Financial Econometrics, 10(4)2012: 669-701. Illicit Money Flows as Motives for FDI, with Josef C. Brada and Zdenek Drabek, Journal of Comparative Economics 40(1) 2012: 108-126. GMM Estimation of the Number of Latent Factors: With Application to International Stock Markets, with Seung Ahn, Journal of Empirical Finance 17(4)2010:783-802. 2015 Global Business Outlook Survey completed by Financial Services Research Centre (FSRC) at Wilfrid Laurier University’s Lazaridis School of Business & Economics.